For every search on Google there is an auction for advertising on that query. Quality Score is a key component in every AdWords auction and helps determine what position an advertiser's ad appears in and how much they pay if their ad is clicked. Here's what you need to know about Quality Score. To understand how Quality Score (QS) is used, you first need to understand a little about Google and their advertising platform AdWords. Whenever someone searches on Google there are two processes that happen at the same time. First, Google must go to their index of internet sites and find the top search results for that specific query. These are the “organic” results that you see on every search page. The second process is an ad auction where Google goes to AdWords to find which advertisers may want to advertise on that specific query. Once a list of potential advertisers is found, AdWords must conduct an auction to determine which advertisers will show, what positions those ads will show in, and how much each advertiser will be charged if their ad is clicked by the user. This ranking is done using a metric called Ad Rank. Ads are placed on the page with the highest Ad Rank first and going in descending order to fill available placements. Ad Rank is calculated by multiplying Quality Score by the maximum cost/click (CPC) bid an advertiser has given the eligible keyword. So the higher your Quality Score, the better placement you can get and you can pay less per click to compete with other advertisers. 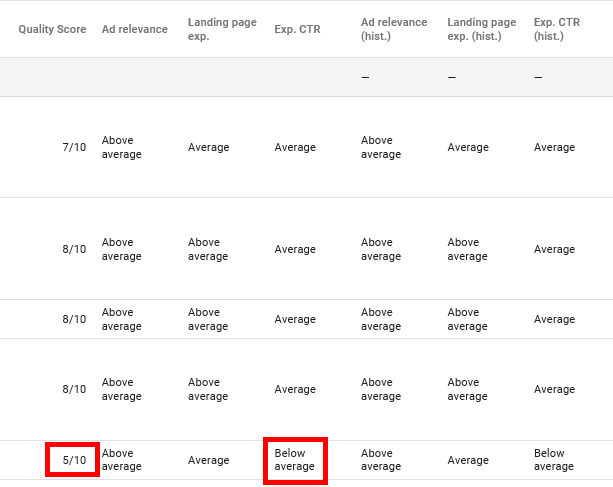 So how does AdWords determine Quality Score? Expected CTR – As defined by Google, this is “how likely it is that your ads will get clicked when shown for that keyword, irrespective of your ad’s position, extensions, and other ad formats that may affect the prominence and visibility of your ads.” They are looking at past performance of the keyword in the account and is based on the assumption that your keyword matches the query exactly. However, Google is adjusting this number for each individual query based on factors such as device type, the exact search query, etc. Keep in mind that this metric is relative, so a CTR of 1% might be Above Average for one keywords while a CTR of 5% could be Below Average for another. Landing Page Experience – From Google, this is “how relevant and useful your website’s landing page will be to people who click your ad. Landing pages with higher ratings are usually well organized and have text that relates to a person’s search terms.” This is somewhat related to SEO in that Google has parsed the page connected with your ad and graded how relevant it is to your keyword. A status of Average of Above Average indicates no problems while Below Average ratings indicate that Google thinks the landing page could be improved. 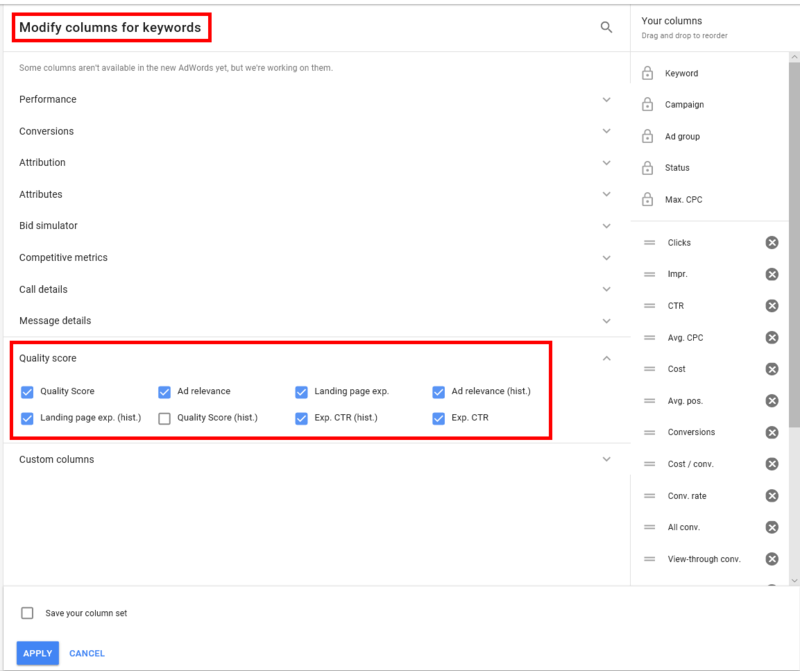 Ad Relevance: This is “how well your keyword matches the message in your ads.” For advertisers with tightly-themed ad groups and ad copy customized to the keywords, this metric is perhaps the easiest to ensure you’re not Below Average. As you can see, Landing Page Experience and Expected CTR are most important with Ad Relevance bringing up the rear. Expected CTR is big because it indicates how likely Google is to make money on a search and so high CTR will always be favored. And when we consider the user experience, Ad Relevance is only a small part of the process. It only connects the search with the ad (and is somewhat already being factored into Expected CTR). But the landing page experience is the real make or break of the experience. No matter how appealing the ad, if people click and immediately hit their back button it makes Google look bad. Basically a bad recommendation. The bottom keyword has a QS of 5 and we can see that the Expected CTR is Below Average. Therefore I would focus on ad copy testing and maybe add some negative keywords to help improve this component, and thus improve my quality score. The same goes for Landing Page Experience and Ad Relevance. Anytime you see “Below Average” it shows that you need to make some changes. Quality Score is a vital component of any AdWords account and has a direct impact on results. Maintaining high Quality Scores leads to better position and lower CPC versus your competitors. Poor Quality Scores will necessitate higher bids to compensate, thus hurting the bottom line.